Yes, this is very late. I keep over-scheduling myself. I have only myself to blame. One-Punch Man Volume Three collects Punches (issues) 16 through 20 (plus some bonus material) of ONE and Yusuke Murata’s ongoing manga. Saitama is super-fast, super-strong, and super-invulnerable. He is also super-obscure because neither Saitama nor Saitama’s acolyte Genos have ever bothered to register with the Hero Association. Time to fix that. Not just anyone can join the Hero Association1. There are tests! Genos passes both the physical and written tests so decisively he is immediately classified as S-class, the elite of superheroes. Saitama, on the other hand, blows the written portion of the test. His physical scores relegate him to the C-class; he’s the lowest grade of hero. Unbeknownst to Saitama (because he’s too indolent to pay attention to the orientation material), C-class heroes are expected to demonstrate their worthiness to remain registered heroes. It’s not until the deadline is bearing down on him that he learns he is supposed to seek out and deal with evil-doers. As luck would have it, evil seems to be taking a holiday that week; search as he might he cannot find a criminal to pummel. What he can do alarm the citizens with his search. They summon Tank-Top Tiger2, a recognized hero, to deal with Saitama…. Saitama is more than able to reduce even the toughest hero to shreds of flesh, so it’s just as well for Tank-Top Tiger (not the toughest hero) that Saitama is distracted by the re-appearance of Speed-of-Sound Sonic, a vengeance-obsessed ninja determined to pay Saitama back for accidentally defeating Speed-of-Sound a few adventures back.. Lucky Tiger. Better to be blown up by a ninja than punched into pink fog by Saitama. Speed-of-Sound for his part is lucky that Saitama finds him amusing because Saitama is also more than able to reduce the toughest ninja into shreds. As long as Saitama finds you funny, the worst that will happen is being slammed into the pavement hard enough to leave an imprint. It is not that Saitama is dim, just that he’s easily bored and assumes anything that isn’t immediately interesting must be absolutely irrelevant. I wonder what a mental health professional would make of Saitama’s odd mix of focus and distractibility, not to mention his constant ennui. One-Punch Man is mostly gore-filled slapstick. There’s one redeeming feature3 (from my POV) which is that Saitama is sincerely trying to mentor Genos. Since Genos is more machine than man, he’s unable to benefit from Saitama’s daily physical regimen, Saitama encourages his friend to focus on improving his mind. It’s not bad advice. Shame that Saitama won’t take his own advice. 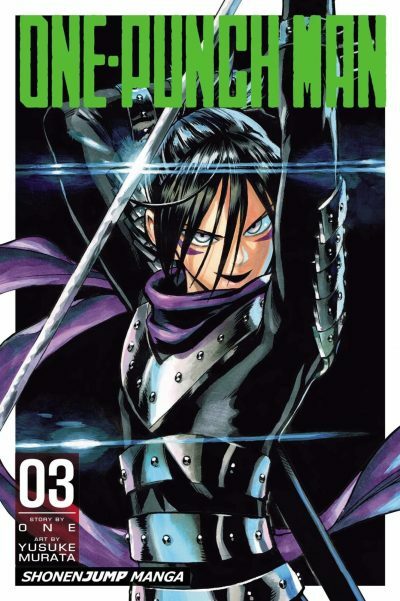 One-Punch Man Volume Three is available here (Amazon), here (Amazon.ca) and here (Chapters-Indigo). 1: One of the registered heroes is a man on a bicycle whose MO is to show up and get pummelled. This suggests that it isn’t that hard to be a superhero. 2: Tank-Top Tiger wears tank-tops and favors a tiger stripe motif. Hence the name. He’s not a half-tank, half-tiger chimera. Although that would be pretty cool. 3: Well, two redeeming features. Saitama could be an epic monster but he never considers a career as the Big Bad. In fact, he is usually careful to moderate how he exerts his strength, which is for the best since when he gets distracted he’s been known to level background mountains.